 every space in the facility. Thousands of miles of AktivLok have been manufactured using state-of-the-science equipment, the cleanest raw materials, and the most consistent color infusion  for toughness, resiliency, shock absorption, durability, safety and great looks. Click Here to calculate the tiles you need. For larger quantities please allow 7-10 business days for order date. AktivLok can be loose-laid over almost any sub-floor or finished floor, without permanent bonding to the substrate. Its made of up to 100% post-consumer tire rubber and post-industrial EPDM rubber to the strictest environmental standards, so using it can qualify your facility for LEED credits. AktivLok can be used to create an entire fitness floor in virtually any creative, attractive pattern you can imagine. Or use it in combination with Regupol Aktiv roll flooring as a border or other accent treatment. 24" x 24" sized and 3/8" thickness with interlocking tabs and slots. No adhesives required - "puzzle edges" simply lock together. Tight fitting puzzle edges hide seams and reduce dirt buildup. 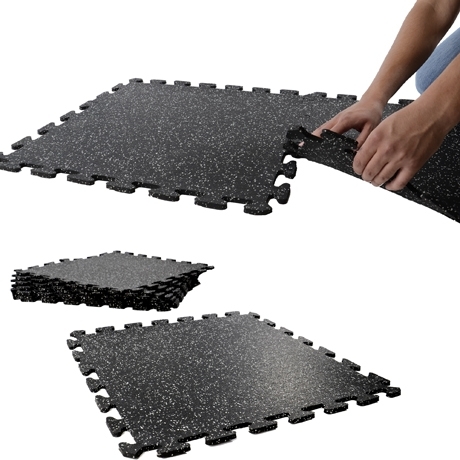 Made from premium-grade recycled tire rubber and colored rubber granules.